Every now and then I like to kick it with a big time Indian dinner. Not that I'm not cooking Indian food almost every day of the week, because I am. But I don't usually make an event out of it. So when I throw a dinner, I throw a dinner! I get out all the Indian dinnerware, pick some flowers and break out the candles. I get into it the same way people hang out at Home Depot and then spend their weekends putting in a hot tub or rewiring something. It is an obsession. It is also my excuse to hang out at the Thailao Market on Santa Rosa Avenue in where else? ?...Santa Rosa! I love this place. They had me at Banana Flower. Okay, enough with the banana flower. I look like I'm trying to juggle torpedoes. What I actually was doing, was trying to plan a menu for some visiting friends from San Francisco, Bob and Cathy Barner. Cathy is the Director of Park Projects and Stewardship for The Golden Gate National Parks Conservancy. Bob is a well known Childrens' book author. 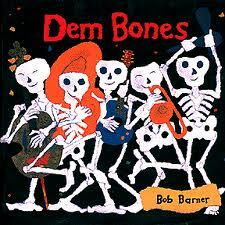 Here's one of his books, Dem Bones. Our friends Chip, Terri and Ray joined us and of course Mr. X, the Million Dollar Cauliflower Man. 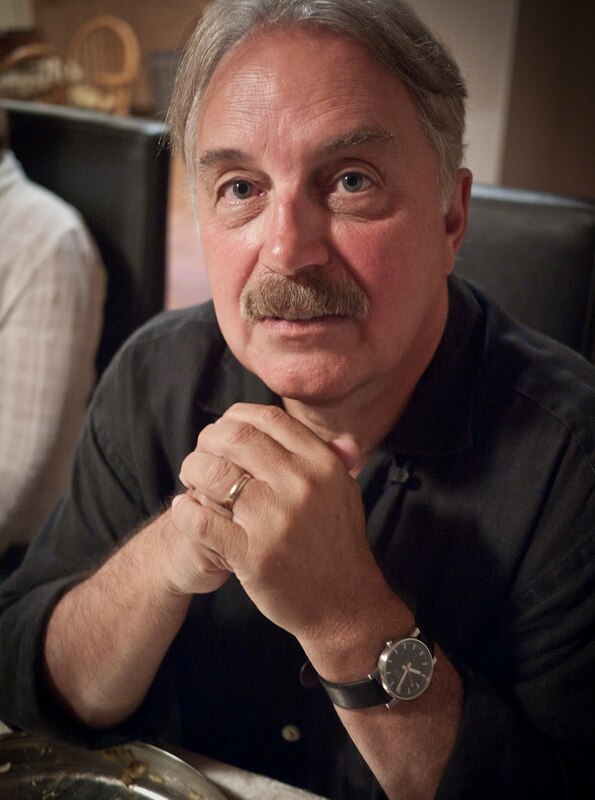 Bob and Cathy had just returned from a month in India where Bob had been invited to speak at some schools. 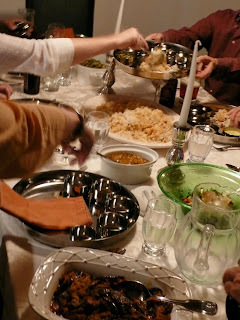 They happened to be visiting Sonoma for a months' vacation which was all the excuse I needed to toss an Indian feast. Since Chip is a vegetarian (he does eat fish) the dinner would contain no land-based protein, except for the legumes. Can't forget the legumes. Got to love the legumes. Can't live without them. Any Kerala dinner of course has to start with a sambar. Sambar is a spicy broth, that's made up of toor dal which has been soaked and ground and blended with a combination of spices, most of the time including tamarind. It's cooked in stages and once the grinding and soaking is done, it actually makes up really really fast. 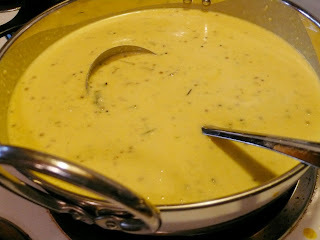 In planning this dinner, I wanted a sambar that would go along with the other things I had planned and so I decided on a buttermilk sambar rather than a tamarind based one. It's called Moru Kuzhambu. I first learned of this recipe from the excellent Vegetarian South Indian Cookbook, Dakshin. This is my adaptation of it. 2 tsp of chana dal in 1 cup of water for one hour. This is one of the things that I like so much about making a sambar. You can make it and quickly finish and eat it, or you can do this part and then set it aside and finish it later. All in, it takes about 30 minutes or so to cook. The other thing a good sambar has is the addition of vegetables. Any number and type of vegetables can be added, from potato to okra to onion. I chose grey zucchini the closest thing I could find that matched the ash gourd of the original recipe. Add a bit of water, just enough so the vegetables are covered, put a lid on it and turn down the heat. Let it simmer for about 10 or 15 minutes, until the veggies are tender. Blend it all together well. Then add the yogurt spice mixture to the squash spice mixture and reheat it all very gently. You don't want to curdle things. When it's heated though, it's ready to serve. So there you go. There's a sambar. Firey hot, but when served with the right accompanying dishes beautifully balanced. When you want to bring the heat, you have to bring the sweet and spicy too, which I'll be getting to. This sambar goes perfectly with a wonderful green bean dish which will be coming soon. Who did not find the legumes particularly interesting. "What? No meat? I'm bored!" Now for the Winner of The Tropical Traditions Organic Shredded Coconut Contest! Our lucky winner is Llinda!!!!! Llinda, if you'll get in touch with me, I'll arrange to have your wonderful coconut sent to you. I know you are going to love it as it's all I ever use! I must say all the dishes looks super super delicous. Hat soff to you for making such a delicous dinner for your friends. What a feast. Your enthusiasm for Indian food amazes me every time. You are so sweet to go all out for your friends. I am sure they had a wonderful time, eating that amazing food. oh kathy what lucky friends you have and they are so fortunate to have your amazing foods....looks awesome! Drooling over the sambar. Can't wait for part 2. YUM! I can imagine the aromatics filling your house... Lucky guests. Wow! 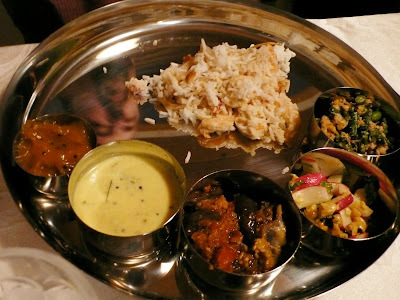 The thali looks very traditional and tempting,Kathy. Good read. This looks great! Thanks for the mention of my books and Cathie's organization. I'm hungry for Indian food all over again. I'm dashing out the door to Kasa for Indian street food right now. Thanks for including us in such a colorful and delicious event. Please give Patsy a hug for us. I am planning a Tour Of India dinner for the early winter (Jan/Feb in NH) and will definitely be checking back with you!! just give me a holler! mr. x is always there..he used to be our across the street neighbor..and when we moved up the hill he still comes over to join in dinner parties.